We invite you to share with us the story of this remarkable place on the southern coast of Western Australia. 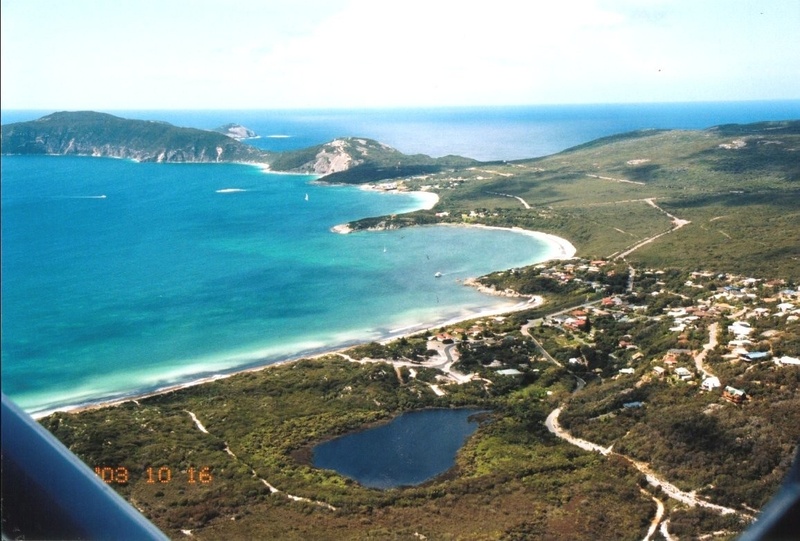 FRENCHMAN BAY is located 20 kms drive south of Albany, on a spectacular area of coastline adjacent to the magnificent Torndirrup National Park. When standing at one of many local viewpoints, gazing out over King George’s Sound and the vast oceans beyond, the imagination easily conjures ancient geological events and histories long predating any human interventions. Today, commercial fisherman, recreational sailors and passing cargo and passenger ships, share the expanse of the Sound with migrating whales, schools of dolphins and a diversity of other marine and seabird life. While Albany has a sub-humid Mediterranean climate with warm dry summers and cool wet winters, Torndirrup is encircled with water – no area being more than 5kms from sea – and so has its own distinctive maritime climate. The average rainfall is annually between 900-1000 mm and temperatures are rarely higher than 35C and minimums of 5C are also rare. (Vic Smith 1991: 280). In the aerial view below, the lake in the foreground is ‘Lake Vancouver’, the long straight beach is ‘Goode Beach’ and the settlement in the foreground is also named ‘Goode Beach’, the nearest horseshoe shaped beach is ‘Whalers Beach’ where the freshwater streams flow year round and where the French made camp in 1803. Near the horizon it is possible to glimpse Bald Head. To the left is the beginning of Torndirrup National Park. ‘South Coast’, Albany Advertiser, 1935. The ‘squeaky and musical’ quality of the sand of Goode Beach and all around Frenchman Bay, is often commented upon by visitors and generally attributed to the fact it is almost pure quartz with grains which are very fine and evenly ground. After the establishment of a British settlement at Albany in 1826, Mistaken Island at the northern end of Goode Beach was used as a makeshift quarantine station. Visiting ships were inspected and if any person on board was thought to be carrying small pox, all passengers and crew were interned on Mistaken Island. Early survey maps, prepared by the Colonial Draftsman Alfred Hillman in 1835 and 1836, show the area of from Mistaken Island, including present day Goode Beach, and stretching to Whalers Beach, as ‘Quarantine Bay’. This usage continued until the nearby Quarantine Station at ‘Quaranup’ was built in 1875. Two years later, the surveyor and Naval Commander W.E. Archdeacon produced a map on which he replaced the reference to ‘Quarantine Bay’ with ‘Frenchman Bay’. Archdeacon was acknowledging the visits of French explorers Nicolas Baudin (1803) and Dumont d’Urville (1826) who replenished their ships from the fresh water springs that still flow into what is today known as ‘Whalers Beach’. Frenchman Bay thus incorporated the large section of Vancouver Sound that includes present day Whalers Beach and Goode Beach. We wish to acknowledge the work of Vic Smith who investigated and documented the fauna and flora of Frenchman Bay in his book Portrait of a Peninsula: The Wildlife of Torndirrup, (Wallace Smith, Goode Beach, Albany, 1991). Vic Smith was a long-term resident of the area and member of the FBA. His publication has provided a wealth of information for this website – as one of the few existing publications with a unique focus on the area. Thanks to Ashlee Perry who constructed the initial website and Canaan Perry for the locally recorded sound file of the ‘Golden Whistler’. The Humpback Whale sound file was retrieved from http://soundbible.com/tags-whale.html. Thanks to Tim Winton for permitting the long quotation in the ‘Whaling to Whale Watching‘ section of this site. ‘Australians Say No to the Resumption of Whaling’, The Last Whale (website), archived at: http://pandora.nla.gov.au/pan/82941/20110518-0025/thelastwhale.wordpress.com/index.html (retrieved 23/01/14). Thanks to FBA members for text and photographic contributions: John Kagi, Richard Vogwill, Phil Roberts, John Kelly, John Myer, Max Angus, Eric Harley, Catherine Macdonald, Bill Deacon, Janet Hole and especially Ruth Keszia Whiteside and Della Foxglove who produced the initial version of the website. 6. Vic Smith & M.J. Bamford, Portrait of a Peninsula; The Wildlife of Torndirrup, (Wallace Smith, 1991), p.19 and passim. Vic Smith is a long term resident of Frenchman Bay and this publication remains one of the most comprehensive surveys of the area.